Homomorphic encryption is a form of encryption which allows specific types of computations to be carried out on ciphertexts and generate an encrypted result which, when decrypted, matches the result of operations performed on the plaintexts. This is a desirable feature in modern communication system architectures. RSA is the first public-key encryption scheme with a homomorphic property. However, for security, RSA has to pad a message with random bits before encryption to achieve semantic security. The padding results in RSA losing the homomorphic property. To avoid padding messages, many public-key encryption schemes with various homomorphic properties have been proposed in last three decades. In this chapter, we introduce basic homomorphic encryption techniques. 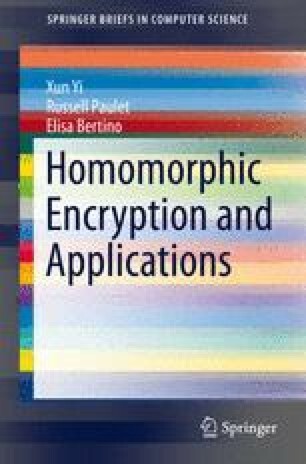 It begins with a formal definition of homomorphic encryption, followed by some well-known homomorphic encryption schemes.